It seems hard to believe, considering how much emotion, outcry, and protest has occurred since, but the death of 28-year-old Sandra Bland happened just under two weeks ago. 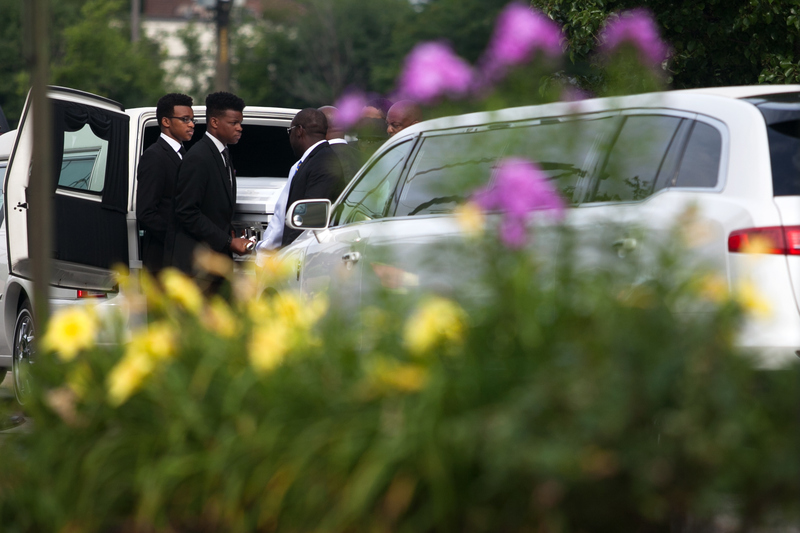 And now, she's been laid to rest — here are nine powerful images from Sandra Bland's funeral, which took place at DuPage African Methodist Episcopal Church in the Chicago suburb of Lisle, Illinois, on Saturday. The circumstances of Bland's initial arrest, and her subsequent death in a Waller County, Texas, jail cell, are about as charged right now as they can get. Controversy continues to cloud even the very circumstances of how she died — Texas authorities have maintained she died by suicide, but many people close to her aren't convinced, including her mother, Geneva Reed-Veal, and her sister, Sharon Cooper. According to The New York Times, the subject was broached by the Reverend Theresa Dear, who said of Bland's life, faith, self-esteem, and enthusiasm, that "none of that adds up to taking one's life or suicide." Bland was well-loved by her family, friends, and community, that much is obvious. Her funeral was reportedly attended by hundreds of mourners, many of whom had never even met her, but had come to pay their respects nonetheless. Here are some of the scenes photographers captured from her services, but fair warning: it can be difficult to see people in states of mourning. The funeral was held in Lisle, which is a majority white suburb of Chicago. The DuPage AME Church was very close to where Bland was raised, and according to The New York Times, she was apparently enthusiastically engaged with her church community — Dear also told them that Bland helped orchestrate the church's recent Women's Day. A huge reason that so many people close to Bland have questioned why she would have taken her own life is that she was just about to embark on a new chapter. At the time she was pulled over and arrested by Officer Brian Encinia in the Texas city of Prairie View, she was about to begin a new job at her alma mater, the historically black Prairie View A&M University, from which she graduated in 2009. The grief that Bland's family and friends must have felt on this day is self-evident. In addition to those people who showed up to the funeral because they'd been moved by her story, or felt called to action by her example — Bland's death and the ongoing controversy surrounding her arrest and jailing have clearly inspired and devastated countless people around the country. As for what will happen next, that'll depend on whenever the official investigation concludes — the Waller County DA's Office released Bland's autopsy report on Friday.